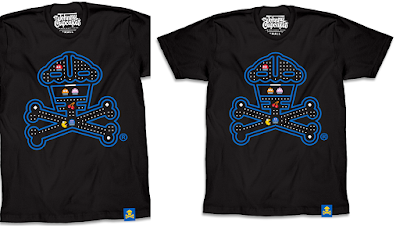 Check out this awesome new Johnny Cupcakes t-shirt, “Snack-Man Crossbones”! With this retro design, Johnny pays tribute to one of the most iconic video games of all time, Pac-Man! The Blot would love it if we were able to play a cupcake stage of Pac-Man one day. The Pac-Man inspired “Snack-Man Crossbones” is available now, in sizes XS-3XL, at the Johnny Cupcakes online store for $35.99. But act fast as many sizes are already sold out!